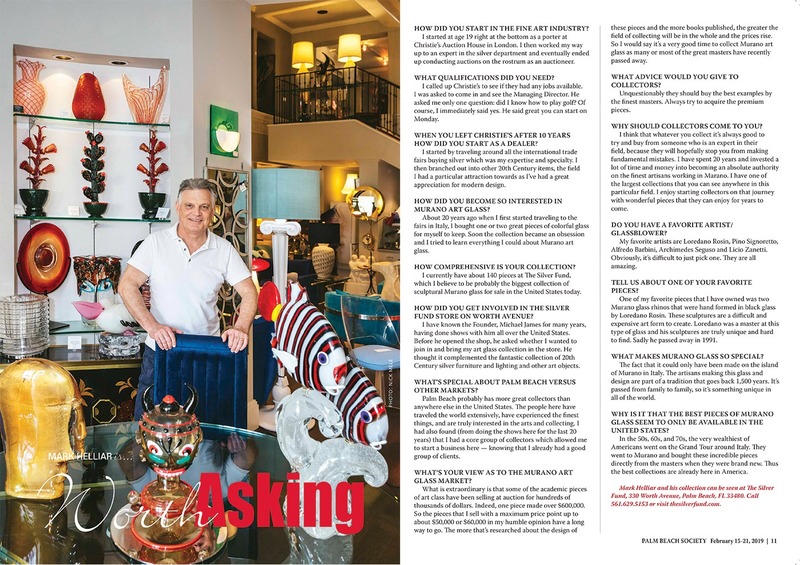 Palm Beach Society Magazine recently interviewed Mark Helliar about his background dealing in art and antiques and the extensive collection of Murano glass at The Silver Fund. Easy-to-read text is below the image below. HOW DID YOU START IN THE FINE ART INDUSTRY? I started at age 19 right at the bottom as a porter at Christie’s Auction House in London. I then worked my way up to an expert in the silver department and eventually ended up conducting auctions on the rostrum as an auctioneer. WHAT QUALIFICATIONS DID YOU NEED? I called up Christie’s to see if they had any jobs available. I was asked to come in and see the Managing Director. He asked me only one question: did I know how to play golf? Of course, I immediately said yes. He said great you can start on Monday. WHEN YOU LEFT CHRISTIE’S AFTER 10 YEARS HOW DID YOU START AS A DEALER? I started by traveling around all the international trade fairs buying silver which was my expertise and specialty. I then branched out into other 20th Century items, the field I had a particular attraction towards as I’ve had a great appreciation for modern design. HOW DID YOU BECOME SO INTERESTED IN MURANO ART GLASS? About 20 years ago when I first started traveling to the fairs in Italy, I bought one or two great pieces of colorful glass for myself to keep. Soon the collection became an obsession and I tried to learn everything I could about Murano art glass. HOW COMPREHENSIVE IS YOUR COLLECTION? I currently have about 140 pieces at The Silver Fund, which I believe to be probably the biggest collection of sculptural Murano glass for sale in the United States today. HOW DID YOU GET INVOLVED IN THE SILVER FUND STORE ON WORTH AVENUE? I have known the Founder, Michael James for many years, having done shows with him all over the United States. Before he opened the shop, he asked whether I wanted to join in and bring my art glass collection in the store. 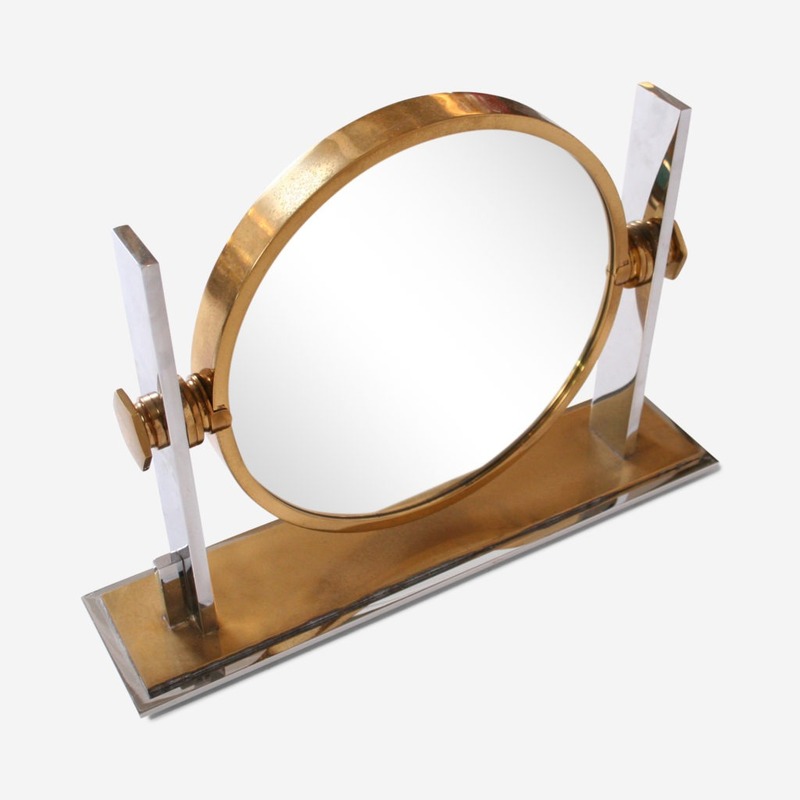 He thought it complemented the fantastic collection of 20th Century silver furniture and lighting and other art objects. WHAT’S SPECIAL ABOUT PALM BEACH VERSUS OTHER MARKETS? Palm Beach probably has more great collectors than anywhere else in the United States. The people here have traveled the world extensively, have experienced the finest things, and are truly interested in the arts and collecting. I had also found (from doing the shows here for the last 20 years) that I had a core group of collectors which allowed me to start a business here — knowing that I already had a good group of clients. WHAT’S YOUR VIEW AS TO THE MURANO ART GLASS MARKET? What is extraordinary is that some of the academic pieces of art class have been selling at auction for hundreds of thousands of dollars. Indeed, one piece made over $600,000. So the pieces that I sell with a maximum price point up to about $50,000 or $60,000 in my humble opinion have a long way to go. The more that’s researched about the design of these pieces and the more books published, the greater the field of collecting will be in the whole and the prices rise. So I would say it’s a very good time to collect Murano art glass as many or most of the great masters have recently passed away. WHAT ADVICE WOULD YOU GIVE TO COLLECTORS? Unquestionably they should buy the best examples by the finest masters. Always try to acquire the premium pieces. WHY SHOULD COLLECTORS COME TO YOU? the largest collections that you can see anywhere in this particular field. I enjoy starting collectors on that journey with wonderful pieces that they can enjoy for years to come. DO YOU HAVE A FAVORITE ARTIST/ GLASSBLOWER? My favorite artists are Loredano Rosin, Pino Signoretto, Alfredo Barbini, Archimedes Seguso and Licio Zanetti. Obviously, it’s difficult to just pick one. They are all amazing. TELL US ABOUT ONE OF YOUR FAVORITE PIECES? One of my favorite pieces that I have owned was two Murano glass rhinos that were hand formed in black glass by Loredano Rosin. These sculptures are a difficult and expensive art form to create. Loredano was a master at this type of glass and his sculptures are truly unique and hard to find. Sadly he passed away in 1991. WHAT MAKES MURANO GLASS SO SPECIAL? The fact that it could only have been made on the island of Murano in Italy. The artisans making this glass and design are part of a tradition that goes back 1,500 years. It’s passed from family to family, so it’s something unique in all of the world. WHY IS IT THAT THE BEST PIECES OF MURANO GLASS SEEM TO ONLY BE AVAILABLE IN THE UNITED STATES? In the 50s, 60s, and 70s, the very wealthiest of Americans went on the Grand Tour around Italy. They went to Murano and bought these incredible pieces directly from the masters when they were brand new. Thus the best collections are already here in America.